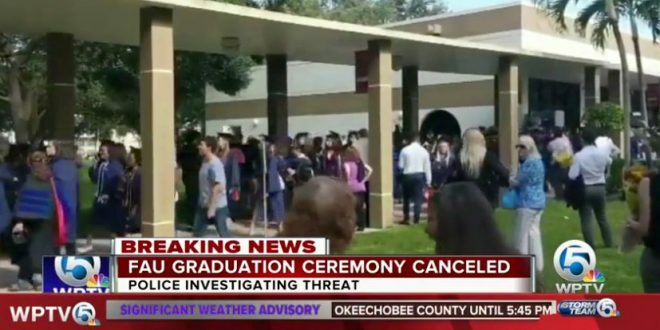 FLORIDA: University Graduation Ceremony Canceled After Note Found Threatening Mass Shooting [VIDEO] - Joe.My.God. Florida Atlantic University canceled tonight’s graduation ceremony after a “credible threat” was found in a note stuck to a mirror in a women’s bathroom on campus. A staff member found the small sticky note at about 4:15 p.m. in the Business Building. The investigation of FAU’s Student Union continues. Updates will follow as information is available. #FAU Should do something special for the students who were supposed to graduate today. Parents spent over 40K, family flew from around the world, and students spent many sleepless nights just to live this moment. This day is a milestone for every student!